I have a backyard smoker, and I use a tray of water in it as thermal mass to help keep the temperature stable. I don't think the size of the tray is going to matter, but it's roughly 40cm x 30cm x 10cm. Having to keep the tray full of water is a bit of a chore, so I thought about putting a second tray of the same size in. Would this make any difference at all to the speed the water evaporated at? If not, what difference would a single larger tray make, if any? One important thing to note is that my smoker is temperature controlled (like a normal oven), so it's going to stay at whatever temperature I set it to. More water in the smoker = more stable temperature. You can prove this by putting in a smaller pan of water than usual and noticing that the temperature swings more. So to answer your question: if you initially add more water to the smoker, yes you will get more water vapor after 60 minutes in the smoker. But the fraction of initial water you added will always been the same at 60 minutes no matter how much you started with. For example, after 60 minutes let's say half the water is gone. That will be true whether you add 100 grams or 1000 grams. That's why the answer is kind of yes and kind of no. Not the answer you're looking for? Browse other questions tagged thermodynamics evaporation or ask your own question. Is this air cooling idea feasible? How can I estimate the cooking time of a roast? Why doesn't a glass french press shatter when boiling water is poured in? How long can a thermal flask hold heat? Why doesn't the gravitational energy in this system of evaporating and condensing water violate the second law of thermodynamics? 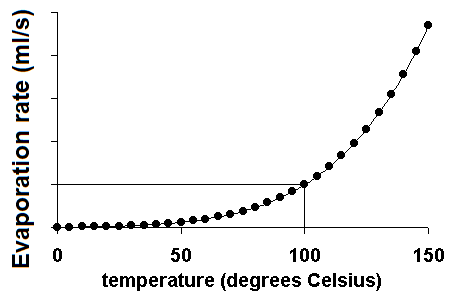 Will pressure of water kept at constant volume increase indefintely with temperature? Will an ice cream scoop with oil-filled handle cool down my coffee more effectively than without the oil?